“Climate change is real, it’s serious, and it’s worsening,” said Sachs, director of the Earth Institute at Columbia. “There is no real scientific debate . . . The facts are rigorously established and the risks are absolutely understood—but we have confabulated a political debate in this country. This is a reflection of our money politics beyond anything else, [including]the oil, coal, and gas industries,” he said. 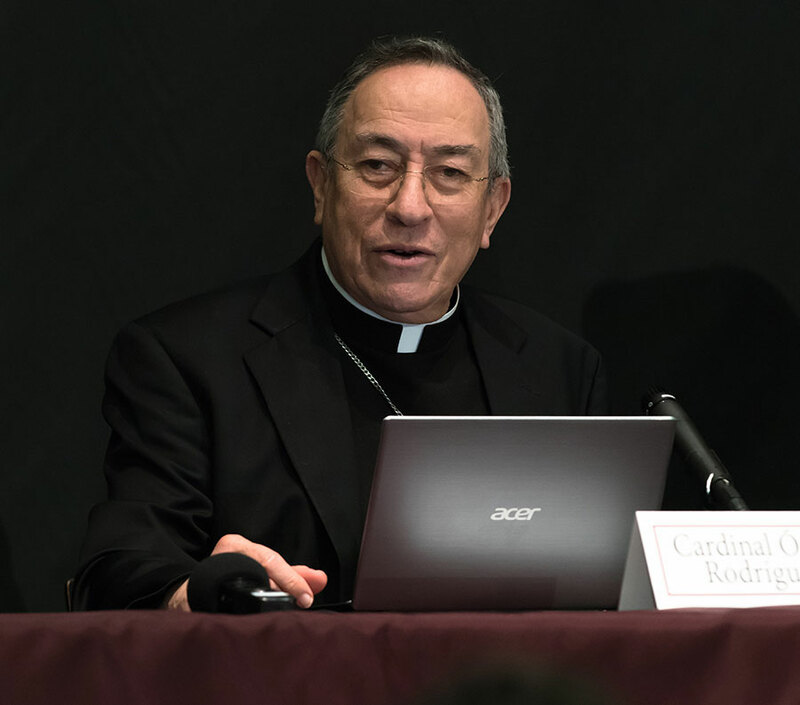 Sachs and Cardinal Óscar Rodríguez Maradiaga, SDB, Archbishop of Tegucigalpa, Honduras, were panelists for “Our Planet’s Keeper? The Environment, the Poor, and the Struggle for Justice,” an event sponsored by Fordham’s Center on Religion and Culture on Nov. 3. In a discussion moderated by Joan Rosenhauer, executive vice president for Catholic Relief Services, both Sachs and Cardinal Rodríguez praised Pope Francis’ 2015 encyclical Laudato Si, which recognizes global warming and addresses environmental degradation. The pope consulted more than 200 experts on these topics, yet Laudato Si has been met with strong criticism, said Cardinal Rodríguez. Some critics decry the encyclical and its condemnation of consumerism; others argue that the pope should refrain from political matters altogether. In the spring of 1963, at the height of the Cold War, an ailing Pope John XXIII vowed to devote the remainder of his papacy to establishing peace. The result was Pacem in Terris, an encyclical that urged governments to recognize their civic responsibility for the well-being of the world and to situate power relations within a moral framework. Two months after the encyclical’s publication, President Kennedy gave the commencement address at American University. Drawing on the encyclical’s push for a geopolitical moral framework, the president called for Americans to reexamine their attitudes about peace. The starting point, he said, should be the recognition that we are all human beings. Six weeks later the Partial Nuclear Test Ban Treaty was signed, and five years later came the Treaty on Nuclear Non-Proliferation. “Framing the situation in a moral way is what pulled us back from the brink,” Sachs said. “Not game theory calculations, not talk of mutual assured destruction, not a list of what the other side has to do and here’s the red line—it was saying that we have to examine our own attitudes, because the other side is also human and they will make the same judgment.